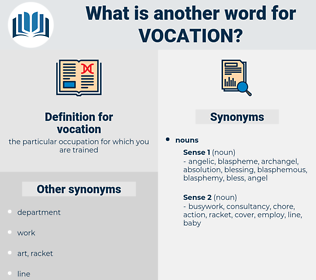 What is another word for vocation? Tradesmen, aspiration, devotion, direction, commitment, task, destination, function, mandate, destiny, remit, appointment, nature, role, duty, objective. calling, inclination, mission, orientation, dedication, occupation. entertainment, hobby, fun, amusement, unemployment, pastime, recreation, surrender, avocation. Hundreds of men and women come to us, only to find that they have started in the wrong work and have remained in it so long that a change to their true vocation is practically impossible. 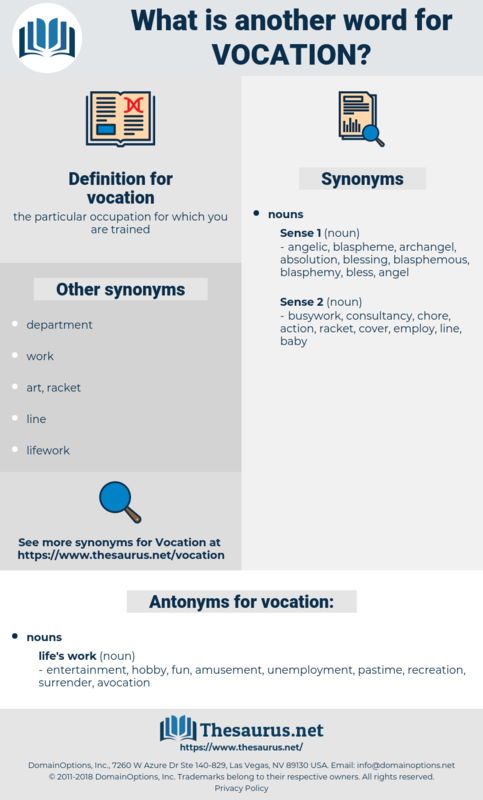 It matters not so much what our vocation as how it is performed.